LyncMicrosoft Store app uses the audio and video devices that are set as the default in Windows 8 or Windows RT. This includes devices such as your computer’s mic, speakers, and built-in camera. However, you can connect another video device, such as a USB camera, and start using it instead. Plug in the new camera and let your computer install the drivers, or install them manually. The next time you start a video conversation, that device (camera) is used. 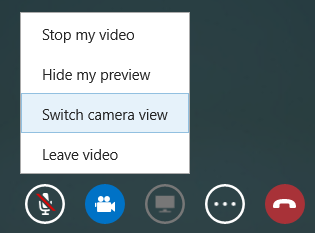 If you want to change the camera during a conversation, just select Video > Switch camera view. The device you’re switching to must be installed and connected. Note: To change your audio device, use the Windows Control Panel (Sound > Manage audio devices).